I know I've had one (or two) and I'm pretty sure you've had one as well. Here's this week's question of the week. What is the worst hair style you have ever had? Describe it in all the its gory detail. Come on...be brave. You can tell me. I promise I won't tell a soul (well almost no one). And to make you feel safe and warm, here are two of my worst dos! Freshman year in high school, I had an honest to goodness...mullet. I think it was called a Sassoon, but that was just a fancy name for a mullet. You don't have to wonder why I was frequently mistaken for a boy do you. But to be honest, this isn't the worst hair style I ever sported. No, that came my Junior year. I got one of those circular page boy cuts. It was basically....a bowl cut. The idea was to have it all go under all around my head. But knowing how patient and talentless I was at "doing" my hair, I'm sure it just stuck out in all directions. And here is a photo to prove it. Nice flip on the left side there, girl. At least I didn't let my lack of style bring me down. Now, it's your turn. Tell me about your worst hair style. I have curly hair so the worse cut I ever had was when my mom had it cut very short like a boys--no mullet--just really short! I was so embarrassed! It was definitely when I got one of those poodle perms!!! How horrible! I should have just washed it out immediately - oh, and I've destroyed all pictures of it so it's like it never happened, Ha! I would definitely have to saw my 2 perms, I definitely remember my 8th grade picture. 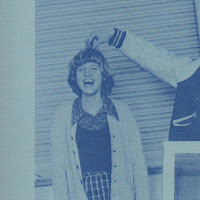 Also, my hair was pretty funky my freshman year of high school. I was doing some weird thing with my bangs. I don't ever want to see those photos again! Oh Wendy...I can almost see that hairdo. I'm so glad you had me brace myself. kmassman - The worse thing you can do with curly hair is to cut it short. You poor thing. Kelly and Kim - Got to agree..my perm days were very interesting as well. I guess I should dig out the pictures from when I was pregnant with Mikey cause I had a big old perm then. All I can say is bangs, bangs, bangs! Oh yeah, and the pigtails I had everyday in 2nd grade. For some reason my mother would insist on redoing my hair over and over again until it was perfect...lol! Muma, I have to say, I like the Junior year hair cut better than the Frodo (Kristen's poodle looking dog) perm. You sure have guts to put the Freshman year photo up, I love it though. I would put I picture up, but oh shucks, we can't find my school pictures! My worst hairstyle is always the one I'm currently wearing. I think I was born without that certain hair styling gene that most girls are born with. I think you look adorable with the Sassoon. Caity...Caity....be very careful what you say. I CAN find pictures. Just remember that. I had a bubble that required an entire can of Aqua Net hairspray/week to keep it looking so 'spiffy' (luckily, my parent's owned a drug store)! Many, many years ago, when an old boyfriend picked me up for a date during tornado warnings ... mother said to be watchful of the sky. He replied, "If I see one hair on her head move, I'm heading for home!" ... a fun post to read. You are so creative!